MOVIE LOVE. LIFE OF PI. | Life Looks Perfect. MOVIE LOVE. LIFE OF PI. Monday night DATE NIGHT yaay! 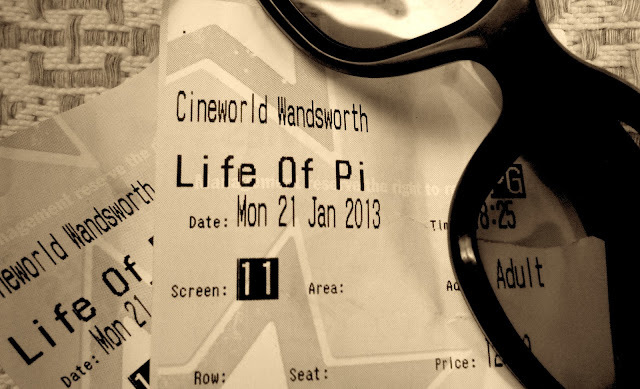 This week we decided to go and see 'Life of Pi', nominated for 11 Academy Awards it was definitely top of the date night agenda! Without giving too much away to those who have not seen the film - an author is sent to meet a man in Montreal called Pi who has a story to tell which will make him believe in God. Pi's story unravels his incredible journey of survival with an unexpected companion - Richard Parker (a bengual Tiger). I was completely drawn in by the opening scene - beautiful shots of animals and birds chattering around a sunlit zoo, setting a tone of magic and mystery. We watched the film in 3D with our dorky glasses which were £2.50 each, can you believe it so expensive!! But I have to say the CGI was absolutely fantastic, at no point in the film did you not believe the landscape or characters - simply breathtaking! Throughout the film I did have a nervous / anxious feeling in my stomach as you were never too sure what was around the corner. With most of the film being based out at sea with Pi on a flimsy raft I couldn't help but have the 'Jaws' theme tune in the back of my head and expect a mammoth shark attack - but luckily that did not happen! Life of Pi is filled with beautiful metaphors and imagery touching on all bases with humour, sadness and happiness. It is not necessarily the entire 'Life of Pi' merely an Adventure of Pi - as the majority of the film focuses on his time at sea with Richard Parker - slightly mirroring the struggle of Tom Hanks and his volleyball 'Wilson' in the film 'Cast away'. After leaving the cinema and catching adverts for the movie on TV it really reiterates what a visually beautiful and thought provoking story it is. Would definitely love to watch it again soon! P.S Watch out for the moving horizon, because even on the big screen motion sickness kicks in!